When you think of a thermometer, you tend to think of a simple weather instrument that has the power to measure the temperature in a specific area. In the thermometer market, there are some weather instruments that are built with unique features and powerful displays that make checking the temperature an enlightening experience. Today, there are hundreds of different indoor-outdoor thermometers, making it difficult to decipher what is the best indoor-outdoor thermometer. After spending a wealth of time studying and experimenting, we have narrowed down our list to, what we considered, the top rated indoor-outdoor thermometers. These weather instruments are considered high-quality, most accurate, and offer something different and unique. The most important thing that all consumers must take into consideration is that all indoor-outdoor thermometers are designed differently. Some of them will have specific requirements for where you can place them, and others are entirely wireless and come with sensors for you to manually place. Before you are quick to purchase, be sure that you know where the thermometer can be used and what their transmission ranges are. Another critical component to look for in an indoor-outdoor thermometer is the price. Today, there are hundreds of different thermometers, all claiming to be the best and most innovative ones on the market today. In truth, if a consumer does proper research, you can find a high-quality and decked-out indoor-outdoor thermometer for less than $30. As you will notice almost every single one of the thermometers on our list are nearly under $30. As always, take the time to review all of the features that an indoor-outdoor thermometer comes with. As we said before, each weather instrument is designed with a specific intention in mind. Before you purchase just any thermometer, be sure that you are receiving all of the features that you will use. Some of these products will come with more bells and whistles; however, this will come at the expense of more money. Take the time to evaluate what is important and what is useful. In the indoor-outdoor thermometer industry, there are not many weather instruments that can compete with AcuRite’s 02027A1. This product is the costliest of the batch; however, it comes with all the bells and whistles that an enthusiast or professional would be looking for. With an illuminated color display, focused sensors, and a self-calibrating forecasting feature, there is a reason why this product has been awarded a top-rated indoor-outdoor thermometer. Let’s check out some of the advantages and disadvantages of this product. Tracks indoor and outdoor weather patterns, including temperature, humidity and moon phases. Intelligent clock and calendar display. Personalized weather report based on consumer’s backyard. Focused sensors for accurate data reporting. While this weather instrument may be more expensive than other indoor-outdoor thermometers on this list, there is a reason why it’s considered one of the best indoor-outdoor thermometers. This weather instrument comes built with the best features that a thermometer can offer, and more. With that being said, it’s without question that this thermometer is worth it. However, it’s specialized for a homeowner that would not rely on wireless technology. If you are seeking a wireless indoor-outdoor thermometer, this is not for you. The AcuRite02027A1 indoor-outdoor thermometer comes with the most extensive features. This product can predict the forecast, measure the humidity, track barometric pressures, and even gauge the state of the moon. The AcuRite brand utilizes a color display to help consumers differentiate between data reporting of indoor and outdoor. The makers of this indoor-outdoor thermometer are said to be incredibly friendly and willing to work with any consumers. Should you have any problem, the customer service team will help find a solution. 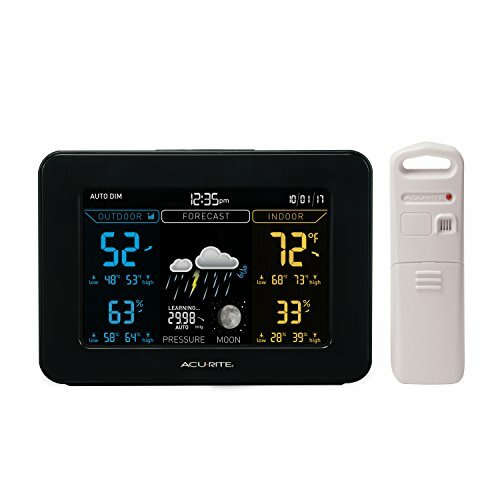 AcuRite 02027A1 is unlike many other outdoor thermometers whereas this product can track local data organically, without having to connect to the local weather station. The AcuRite 02027A1, while it comes with color imagery, the design and text of this indoor-outdoor thermometer are quite underwhelming. In fact, some consumers have reported that this indoor-outdoor thermometer is difficult to read. The AcuRite 02027A1 is the costliest of the top rated indoor-outdoor thermometers. This product is wired, requiring consumers to plug this indoor-outdoor thermometer into an outlet at all times. Ambient Weather is one of the largest and most prestigious weather and environmental instrument makers in the world today. So, it should not come off as a surprise that their indoor-outdoor thermometer, the WS-1171B, made the list. This product comes with a list of powerful and useful features, all of which have made this one of the most popular options on our list today. With an LCD screen and attractive design, this piece of weather equipment is the perfect compliment to any hobbyist or professional’s home. With that in mind, let’s take a deeper look at what makes this product so special. The Ambient Weather WS-1171B is designed with a stunning design console, which comes in two different colors: black or silver. The wireless sensors in the WS-1171B can track up to 300 feet, with perfect line of sight. If there are walls or other blockages, the distance it can track is significantly decreased to around 100 feet. The design console is easy-to-read and comes with a wealth of features and information. Here, consumers can view indoor-outdoor temperatures, barometric pressures, dew points, humidity, and even track trends in the weather to create pattern and predict the future of the weather. One of the most popular and favorited features about this thermometer is the unique forecast icons. Consumers can quickly gauge what the weather is like, or going to be like, based on this icon, all of which is established and developed based on the barometric pressure. The Ambient Weather WS-1171B comes built with an atomic clock, which can be used to set alarms or be used as a nightlight. If you are seeking a wireless indoor-outdoor thermometer that comes packed with some great features and benefits, then the Ambient Weather WS-1171B is most certainly worth it. In our opinion, the biggest downside of this product is how much information the display screen presents. If you are looking to quickly gauge the temperature, chances are, you will need to get up close to find that specific number. Other than this, the Ambient Weather instrument most certainly out performs much of the competition, placing this product in a league of its own. The Ambient Weather WS-1171B comes built with some of the best features that a hobbyist or professional weather tracker could ask for. 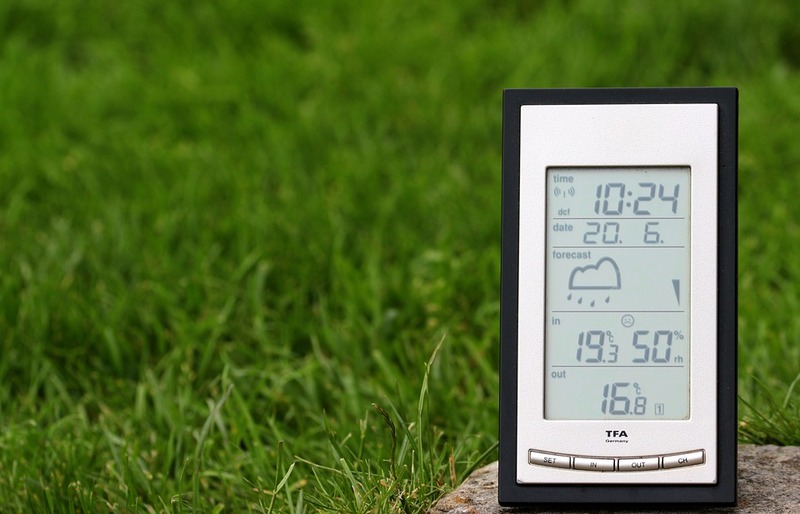 This weather instrument has the ability to tilt up, which creates a tablet-like-feel to the thermometer. The Ambient Weather WS-1171B is a wireless indoor-outdoor thermometer, which may be a determinant factor for some consumers. 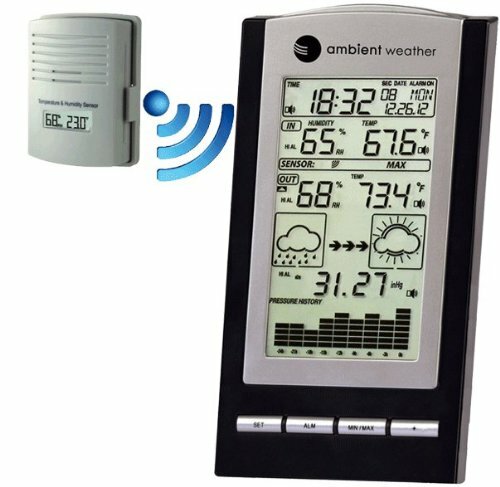 Ambient Weather is a leading company in the weather and environmental instrument industry – known for high-quality products. The display screen of the Ambient Weather WS-1171B may appear slightly confusing when viewing a distance away. This can be attributed to the amount of numbers and graphics that are on the display screen. Out of many of the indoor-outdoor thermometers, the Ambient Weather WS-1171B is considered one of the more expensive weather instrument. 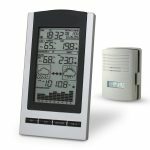 If there is one weather instrument in our Top-Rated Indoor-Outdoor Thermometer list that may surprise you, it’s the La Crosse Technology WS-9160U. For beginners, this weather instrument is relatively inexpensive, making it one of the most cost-friendly options on the market. With that in mind, this product and company boasts some great features, all of which consumers can find it more expensive indoor-outdoor thermometer. Known as one of the best wireless digital indoor-outdoor thermometers on the market, let’s see what it’s all about. The La Crosse Technology WS-9160U indoor-outdoor thermometer boasts transmission ranges around 330 feet, depending on line of sight. 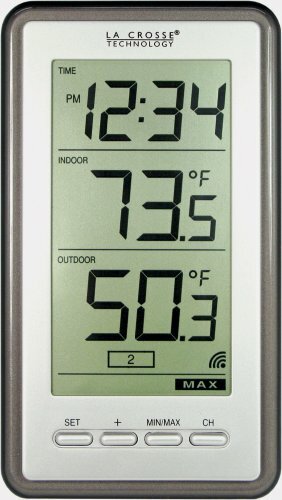 The La Crosse Technology indoor-outdoor thermometer is designed with a beautiful display screen, which measures 3.31”x.0.89”x5.87”. One of our favorite parts about this thermometer are the extra large digital graphics, making it easy to see the numbers from a distance away. This high-quality indoor-outdoor thermometer comes built with a digital thermometer and a wireless remote. The console itself has a built in clock, making it easy to track time all at the same time! The standard edition comes with three integrated sensors to track and collect data. Consumers can track weather temperatures from numerous different rooms, include basements, green houses, and even garage. Consumers also have the option to purchase more sensors. The La Crosse Technology indoor-outdoor thermometer is optimal for the consumer that is not seeking the bells and whistles of a home thermometer. In other words, if you are seeking a high-quality, aesthetically pleasing thermometer that provides accurate data and information, this product is most certainly worth it. When you consider the cost to purchase, it’s a great investment. The La Crosse Technology WS-9160U is a wireless weather instrument, meaning that homeowners can place it anywhere in their home. This powerful weather instrument provides homeowners with the opportunity to track the weather environments in different parts of their home. This is a new feature that many of the competitors do not offer. The La Crosse Technology WS-9160U is built with weather resistant material, all of which is intended to help collect and provide the consumer with the best and most accurate information. This indoor-outdoor thermometer is built to last. Many consumers who have purchased this weather instrument have said it lasted between 7-10 years, which is quite extensive in comparison to the competition. This thermometer comes with a unique tilt-back feature, which many consumers have reported a great benefit. The La Crosse Technology indoor-outdoor thermometer does not provide consumers with all the bells and whistles that other thermometers on this list may. In some cases, consumers have reported that outdoor sensors broke or did not report the correct information. 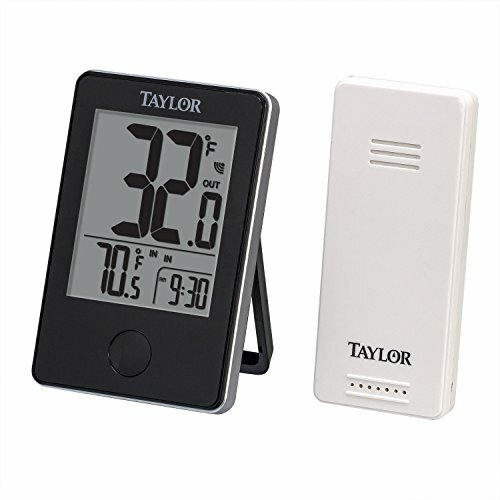 Out of the many indoor-outdoor thermometers on our list, the Taylor Precision Products Wireless Digital Indoor/Outdoor Thermometer is probably one of the most unique. While it does not boast endless features, this wireless thermometer is most certainly the smallest and most compact of the bunch. This product has been a major source of conversation in the industry and today, we are here to explore the reasoning behind it. The Taylor Precision Products Wireless Digital Indoor/Outdoor Thermometer is known as one of the smallest and compact thermometers on the market today. 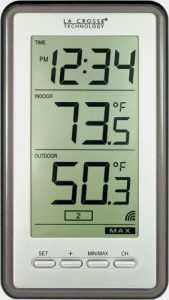 The Taylor Precision Products Wireless Digital Indoor/Outdoor Thermometer boasts a transmission range around 200 feet. This wireless indoor/outdoor thermometer comes built with the ability to track both Fahrenheit and Celsius, digitally. The Taylor 1730 can provide consumers with the measurement of the highs and lows for the temperature of the day. 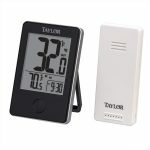 Taylor Precision Products Wireless Digital Indoor/Outdoor Thermometer is most certainly a viable option for consumers. In our opinion, if you are seeking a cheap and easy-to-use digital thermometer in your home, this is a great option. However, if you are seeking some of the added features and benefits that other wireless or wired indoor-outdoor thermometers offer, you may need to spend between $10-$20 more dollars. One of the biggest selling factors and advantages of the Taylor Precision Products Wireless Digital Indoor/Outdoor Thermometer is the compact and small feature. This thermometer will not take up a lot of room, making it easy for homeowners to store. The Taylor Precision Products indoor-outdoor thermometer is incredibly easy to read and understanding, making it essentially fool-proof. This thermometer is the cheapest out of the many high-quality indoor-outdoor thermometers on our list today. The Taylor Precision Products Wireless Digital Indoor/Outdoor Thermometer does not come with any impressive innovative features, aside from being able to track the temperature. Give the cost and value, many consumers have reported that this product has a short life span. HI rimetersght now i have 4 thermometers,including the acurite professional weather center.i like every thing about except,all the information is housed inside,so i put it on the roof so the wind vane would have free movement.the problem that happens is the temperature gage is also inside the unit.therfor i dont get a good outside reading,because of the sun.do you have any sugjestions of where to put it. i want to get another insterment but i know i would have the same problem,can you help me and your thoughts on one that i would feel good about?thankyou mike. Hi Michael. Thank you for stopping by and the comment. I wouldn’t place it directly under the sun or rain. Can you put in under your porch or covered place outside? That’s where I would place it.